Dortmund Slap £65 Price Tag On 19 Y/O Targeted By Liverpool: Gamble But Worth It For Klopp? According to Daily Mail, German side Borussia Dortmund are open to selling Christian Pulisic for a fee of £65m this summer. The US International has been highly linked with a move away from Signal Iduna Park this summer having attracted interest from a series of top clubs across Europe, chief among which are believed to Liverpool. The Reds were previously rebuffed in their attempts to sign Pulisic earlier this summer. But, as it appears, the Premier League giants have been hugely boosted in their pursuit of Dortmund’s teenage sensation, who will be a stunning addition to the club. Liverpool head coach Jurgen Klopp, in particular, will be keen for a reunion with the American whizkid, having coached him during his time at Borussia Dortmund. 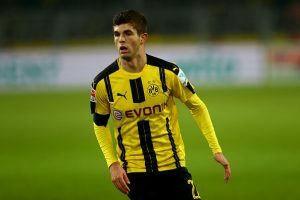 Highly regarded as one of the brightest young talents in European football, Christian Pulisic has been a vital asset for Dortmund for the past couple of years. Since his breakthrough season back in 2016, the 19-year-old has emerged as one of the more prominent players in the BVB first team. In fact, at such a tender age, Pulisic has already notched up almost 100 appearances for his club in all competitions. Thus, he is definitely an experienced operator in the final third, which could potentially ease up his job of settling into life at Liverpool. Unlike many other modern day wingers, Pulisic is an old-school attacker, who is never afraid to change gears in order to catch the defender by surprise. His ability to get to the byline and provide a dangerous cross has been well documented – traits that are necessary to thrive in the Premier League. However, it’s his pace and dynamism which makes him such a sought-after talent in world football. As iterated earlier, Liverpool will be delighted to secure the services of this highly talented attacker, who can be an asset to any team in the world. Following the departure of Philipe Coutinho earlier this year, the addition of Pulisic will somewhat strengthen their offensive department, which already boasts the likes of Roberto Firmino, Sadio Mane, and Mohamed Salah. Although Salah and Mane will most likely occupy the wider positions, Pulisic has shown in the past that he can be very accommodative in the offensive zones. Thus, operating as a number 10 is certainly not far-fetched, given his obvious talent and ability to adapt to change. Read more: Jurgen Klopp Admits Interest In Borussia Dortmund Winger: Should Liverpool Opt For His Services? It is also fair to point out that the American has struggled to make an impression throughout the backend of last season. Having said that, splurging huge bucks on the 19-year-old is definitely a gamble which Liverpool should take if they are to pose a strong challenge for the league title regularly. Bundesliga connoisseur and writer at The 4th Official. My heart belongs to Borussia Dortmund or Eintracht Frankfurt (still not sure who deserves the most), but I adore the Bundesliga and Spanish footballing tactics. 17 years old, Josh rides Tyler |-/ (I already love you if you know what that means)/ Come to my house and we will watch Netflix and eat Nutella, lol just kidding. Nzonzi Slipping Away! 3 Star Midfield Alternatives For Unai Emery’s Arsenal Including This PSG Star! 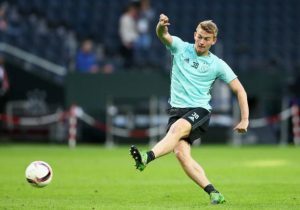 Belgian Defender Set To Quit Manchester City: No Problem For Guardiola As Such! Arsenal’s Star Signing Is Off To A Flier: Is This The End For This Particular Frenchman At The Emirates? Celtic Defensive Beast Red Hot On Borussia Dortmund Radar: Why Rodgers Must Not Sanction His Exit! Klopp Wants To Get This Highly Rated Borussia Dortmund Star: Should Liverpool Go In With A £53m Bid?